Portsmouth needs to seriously consider introducing a Clean Air Zone to improve the air quality of its poorest residents, writes Tim-Sheerman-Chase of the local Green Party. UPDATE: Portsmouth Friends of the Earth relaunched their website, which includes their Streets for People report about peoples’ best and worst roads. Letter outlining the situation and what needs funding. I am writing to you about the ministerial directive on air quality which Portsmouth City Council has received. The city council has dramatically increased the number of air sampling points in the city and our initial reading were that the actual results at the end of the M275 were significantly lower than the modelling had suggested. we were though very concerned about an area not identified by Defra which is the Fratton Road/London Road central route the the middle of the island, that the city council’s monitoring here suggested that there was a problem with air pollution and we have been working to produce a plan to rectify this. I am sorry to have to tell you that the readings that we now have for last year show significantly increased areas of air pollution around the city and we therefore need to look at a much wider and much more radical plan to reduce air pollution. There is the possibility that the readings this year may have been affected by atmospheric conditions but we don’t know and we need to plan. I am very concerned about the possibility of an imposition of a Clean Air Zone on Portsmouth and the increased cost this would load onto both the individual and onto businesses in Portsmouth. 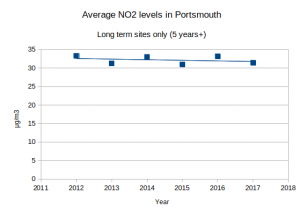 Portsmouth is a city with economic challenges and for both families and for businesses the extra cost of a Clean Air Zone could be hugely damaging. I would therefore like to ask for your support in looking at alternative measures to be able to reduce air pollution and therefore remove the need for a Clean Air Zone. The areas I would ask for your help with may be expensive but I would hope that the government would look to fund these to be able to get the dramatic reduction in air pollution that the ministerial directive expects. I understand that the new burdens doctrine applies and therefore we should be looking to the government for funding. 1) A free bus pass for each resident of the city all day, every day, to encourage people onto buses and out of their cars. 2) The creation of a trolley bus system like that operatives in our twin city of Caen, as there seems to be a much higher usage of tram and trolley bus systems than of buses. 3) Investment to convert the taxi and private hire fleet operating within Portsmouth to an entirely electric fleet. 4) That Portsmouth receives the same level of government subsidy to encourage people to cycle that is received by the London boroughs/TFL. 5) We would like to look at a transfer station where lorries bringing loads into the city can drop off their loads which are then taken in by electric cabs. 6) The government is currently increasing the number of house completions it expects from Portsmouth from around the 430 houses/flats that we currently complete to around 830 per annum. This is clearly completely incompatible with having to significantly reduce air pollution and I would ask for Portsmouth to be relieved of any housing target so we do not make the air pollution situation any worse. 7) We also need to look at the effect that shipping has both in the commercial ferry port and in Portsmouth Naval Base on these air quality figures and to work with the ship owners on a strategy to reduce this level of pollution. 8) A car scrappage scheme targeted at families on the lowest incomes who often have the most pollution vehicles but the least money to replace them with something modern with low emissions. 9) We would also like to be able to run our own bus service and to have a local bus depot to reduce the pollution of buses having to drive into Portsmouth from Fareham. We would be very happy to work with you to try to find way in which we can have a dramatic effect in reducing air pollution. I’m not sure the measures listed will actually solve the air quality problem but they will provide a means to get around the city by public transport, which is a good start. Oh yes, the city council declared a climate emergency and to go zero carbon by 2030. This will have a huge impact on air quality. Comparing the council’s list to Public Health England’s list of proven strategies shows only a … limited overlap. Public Health England published a very important report on the evidence, feasibility and effectiveness of measures to improve outdoor air quality. This helps government bodies focus their resources on measures that are actually beneficial and value for money. I’m still absorbing the report but in a first reading, I found many key quotes that I think are worth sharing. I skipped the sections on industrial and agricultural measures since they are less relevant to Portsmouth. The report confirms much of what we have been saying in #LetPompeyBreathe for some time. P.S. A motion to declare a climate emergency in Portsmouth is going to be debated 19th March. Includes pledge to achieve net zero carbon emissions in the Portsmouth by 2030 – this could have a drastic impact on air quality. Demonstration in support by XRPortsmouth at 11am. See item 16a in the agenda. “Very effective interventions for enhancing public health were road pricing measures, particularly in the case of low and integrated fares (for more than one public transport mode) which facilitate greater public transport use and help reduce social exclusion, and congestion and parking charges, which can help reduce car use (68). Together with representatives from Old Portsmouth and Milton neighbourhood forums, I raised concerns over Portsmouth City Council’s weak actions in tackling air pollution with our Portsmouth South MP Stephen Morgan. We described the city wide air pollution situation, as well as the secrecy and inconsistencies of PCC’s actions. One of the most troubling concerns is that PCC cannot give a straight answer to what traffic growth is expected in the next few years. If they say it is 5% per annum, their air quality plans are insufficient. If it is just 0.5%, there is no need for the city centre road scheme. Can PCC get its story straight? Stephen Morgan seemed to take on the large quantity of information, and said it seems like a failure of governance at PCC, not just a capacity problem (caused by lack of resources). He said he would raise this in the house of commons as a question to the appropriate minister. He also expressed concern that the PCC planning department have been cut back so much as to only be able to be reactive to needs, not proactive. He also mentioned that the full council is going to debate a motion to declare a climate emergency, if I understood him correctly. I will try to get confirmation. 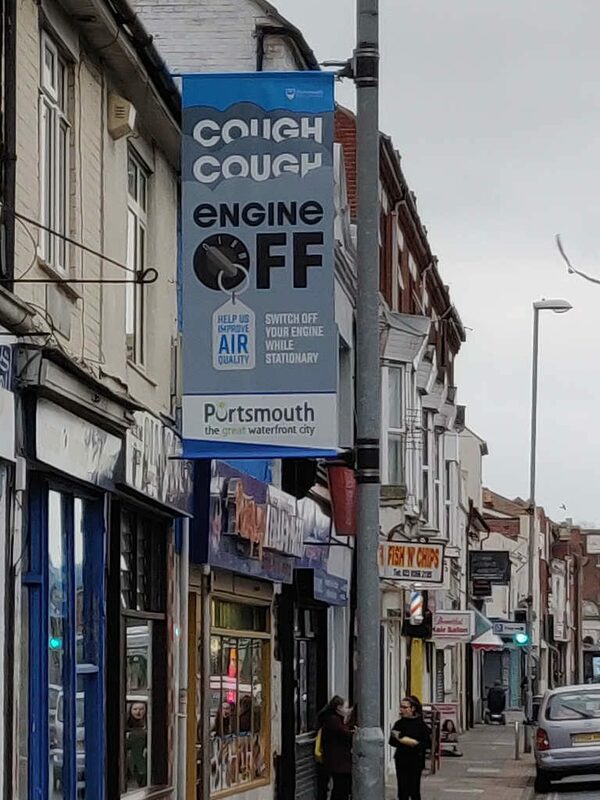 Apparently, PCC’s Cough Cough Engine Off campaign posters were based on Tracey’s poster design (created for #LetPompeyBreathe)! PS PCC where is your draft Air Quality Plan sent to DEFRA at the end of Jan 2019? 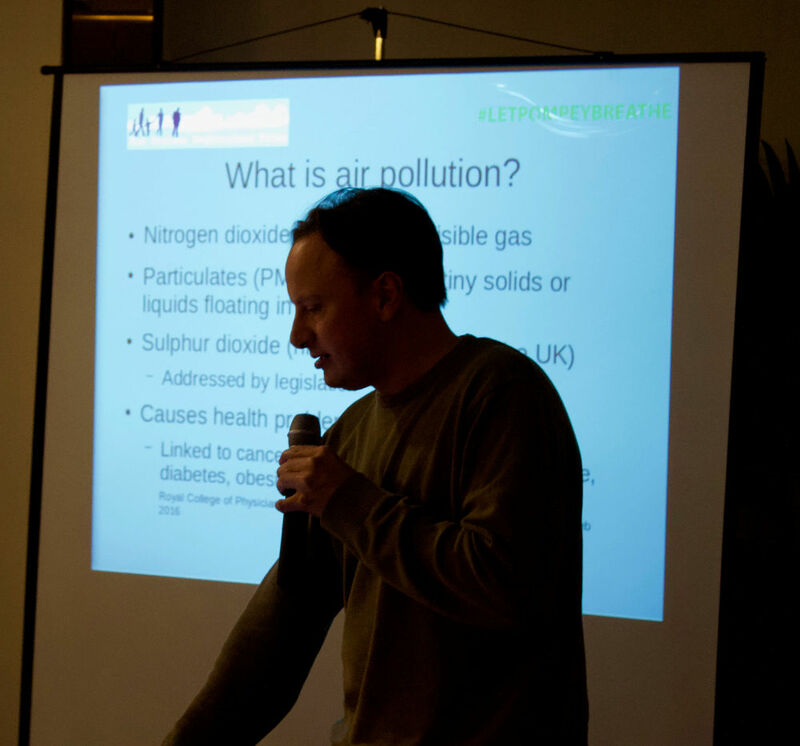 Air Quality Steering Group 16th Jan – Promising TALK FROM Council but Will They Follow Through? I went to the 3rd Air Quality Steering Group (AQSG) on 16th Jan. DEFRA has instructed Portsmouth City Council (PCC) to perform various air quality related actions, including a new draft plan by end of Jan 2019. This plan is hugely important for the future of Portsmouth air quality and I hope PCC will take the necessary strong actions. After a quick introduction by David Ashmore, regulatory services manager Richard Lee outlined recent events. The format was slightly different than previous sessions with Portsmouth City Council (PCC) giving a series of presentations. With the air quality political situation changing rapidly in the last few months, they felt they needed to update everyone. Lee said PCC are committed to take measures that will ensure compliance (in line with the law). The main motivation for this is improvement of public health. He re-iterated the terms of reference for the AQSG were slightly broader than I remembered: to share knowledge, to assist in creating an action plan and to champion improvements. PCC are currently short-listing measures for inclusion in the new plan, which they say will involve “hard choices”. The final plan will be published by the end of Oct 2019. Richard Lee says they will have a programme of continuing improvement after that (but I’m not sure PCC has the political will to follow through considering their lack of progress on air pollution to date). Richard Lee also mentioned that PCC has other objectives such as new developments, but these must “dovetail” with air quality measures. PCC has been operating under various ministerial directives, supervised I think by DEFRA. March 2018 saw a directive to produce a Targetting Feasibility Study (TFS) to address areas of pollution identified by DEFRA found using modelling. For the two areas of concern, PCC produced a report to bring forward legal compliance in air quality by 2021/2022 respectively. However, the areas did not match the worst pollution areas found by monitoring. Monitoring is generally superior to modelled data (since the model is based on the monitoring and is only ever an approximation). DEFRA seems to be sending PCC on a wild goose chase on where to focus effort. However, Lynne Stagg has recently said PCC have argued that DEFRA needs to focus on London Road (AQMA 6) and other areas based on actual measurements. (Doesn’t DEFRA trust PCC air quality monitoring? Slightly worrying.) The TFS has identified various measures including a bus retrofit programme and expanding electric vehicle (EV) charging points. The EV charging points will be a lamp post based solution. The lamp post will be at the back of the pavement away from the road. The power cable travels under the pavement to another bollard at the road side for vehicles in a marked bay to use. This raises the issue of clutter on pavements, which if not done well, could discourage walking in the city. PCC plans 40 by the end of the year, mainly located by requests from the public. The possibility of anti-hogging of EV charging points was discussed but no measures are in place at this time. Three car parks are currently trialling EV charging points (Clarence Pier is one). More publicity of these EV points was requested by Rod Bailey (Milton Neighbourhood Planning Forum). PCC are also conducting an anti-idling campaign. This runs for 4 weeks with radio adverts, social media, online resources and publication of resources (Tracey’s poster was mentioned!) Market research about types of trips and reasons for idling have been conducted. Lamp post banners have appeared on the most polluted roads encouraging drivers to turn of their engines if stationary for more than a minute. Some junctions in Portsmouth have more than a 1 minute wait for traffic e.g. the junction of Priory Crescent/Goldsmith Avenue. Some AQ campaigners in the audience pointed out PCC seem to be watering down their campaign by not mentioning the legal aspect of engine idling. 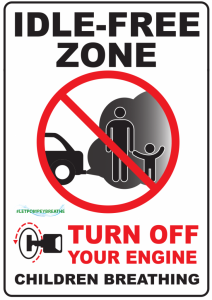 PCC acknowledged that engine idling is illegal but it is not enforced, since resources are better spent elsewhere. PCC are also running Monster Walk at various schools, encouraging walking and discouraging the “school run” by car. They have designed cute characters to spread awareness and free keyrings awarded for successful completion. Bus Retrofit programme is beginning, with changes made to buses less than Euro 6 in certain areas of AQMA 9 around the bottom of M275 (why not AQMA 6/the rest of the city?). I thought that bus engines cannot be simply be swapped, but apparently the retrofit can be done at the rate of 1 bus per day. This probably involves a change to engine emission filtering rather than the engine itself. The target date might be Oct 2019, as far as I remember. PCC only hinted at some of the measures under consideration, such as pedestrianising certain areas of London Road (near Kingston crescent?) or making it one way. Other hints were “reducing car usage” and “encouraging” increased EV usage, both of which are quite vague. I think compliance by 2022 was mentioned as being a DEFRA requirement. One major development was that PCC announced that measures under consideration will be compared to the effect that a charging Clean Air Zone (CAZ) would have on air quality. This was a DEFRA requirement. This is great news as this encourages more ambitious measures to be taken that are quantitatively predicted to be effective. Well done DEFRA and PCC! Our campaign as been calling for this for some time. PCC are planning an Automatic Number Plate Recognition (ANPR) survey of traffic in the city. This will be able to check, at certain locations, what journeys vehicles are taking and what types of vehicles are being used. The survey will be run for 7 days, 24 hours a day, possibly in Feb. PCC’s initial plan of a city wide was scaled back on DEFRA’s request to focus mostly on AQMA’s, involving around 60 ANPR camera locations. Development and growth of the city was briefly mentioned but no specialist PCC officer was available to comment. More development generally means more demand on the transportation systems which is currently too car oriented. Richard Lee claimed future PCC plans would ensure the city remained within legal compliance. My main concern is that PCC considers measures that are ambitious enough, and they don’t mess up the analysis. The report at the end of January will be very significant. Rod Bailey pointed out to me after the meeting that the specific measures were hardly discussed but I think this is unsurprising given PCC are probably working actively on the plan. The air quality petition conducted earlier this year called for a urgent publication of an air quality plan. This has not happened yet because DEFRA required various actions, including a draft plan by end of Jan 2019. What Richard Lee said was very promising: PCC are making a serious attempt to reach air quality legal compliance without the shortest possible time. However, I have my doubts that the councillors responsible (or some group in PCC) have the political courage to take strong actions. (If they had the courage, we would not be in the situation we face. Sorry but true). Regarding clean air day, one audience member, from the University of Portsmouth I think, mentioned textures that respond to pollution which is a way for people to understand the usually invisible problem. There was no mention of a temporary road closure as I previously suggested. I reject any suggestion that the state can have any regard to cost in fixing the target date for compliance or in determining the route by which the compliance can be achieved where one route produces results quicker than another. In those respects the determining consideration has to be the efficacy of the measure in question and not their cost. (and) That, it seems to me, flows inevitably from the requirements in the Article to keep the exceedance period as short as possible. PCC still have not clarified if realistic traffic projections are being used, and if future developments are included or excluded. Air quality planning has previously used lower traffic predictions, while road building has used higher predictions. Consistency on this will be an essential part of PCC’s future plans. PPS The next Portsmouth Climate Extinction Rebellion meet 21st Jan. This is not helpful for air pollution or sustainable transport. The council needs to be encouraging public transport, cycling and walking rather than vehicles that cause congestion and pollution. Steve Pitt (Culture and Leisure): Lynne, you are absolutely right first of all: there are too many cars on the island. It is a grave[?] situation. I know of a three bedroom house that’s got nine cars, which is absolutely ludicrous. So I’ve got three points. The first one is that there are solutions. 30% of all car journeys in the city centre, right around the world, are people looking for parking spaces. There are technological solutions to that. And I know the officers in Portsmouth City Council have known about at least one of these for at least four[?] years. So that is going to take people with an app to a parking space. The second point is that in the future we are going to be going electric. Government policy includes[?] diesel/electric so that should solve a lot of the pollution problem. And the third point is that, again, in the future as we get more driverless vehicles, we are going to have fewer cars owned by individuals. Cars spend 90% of the time sitting at the inelastic roadside are [in future] going to be pick-up-and-go cars, that are going to be electrically driven, pollute less, and there will be far fewer on the road. So there is a good long term outcome and that is coming towards us a lot faster than predictions even three or four years ago. Lynne Stagg: The parking scheme is called AppyParking. That really only applies to places where you pay for parking because you have to have the sensors in the road. Audience member: You can do it with non-pay parking. Lynne: Yes I think you can but [we are tackling it] bit by bit. We are putting electric charging points in. We have put in 50 so far. 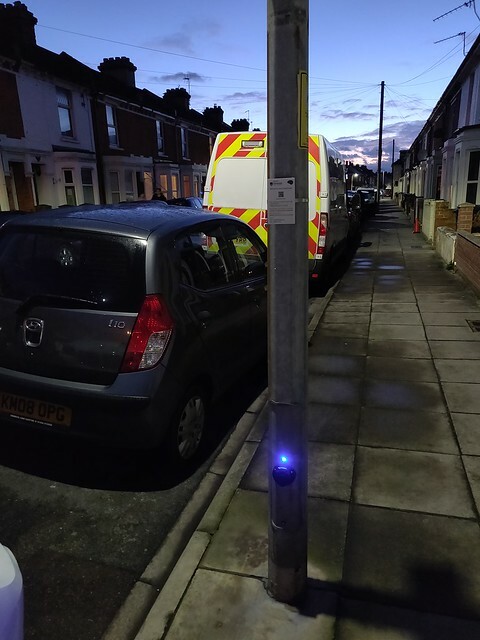 That again is a chicken and egg situation because as well as putting in electric charging points, they have to go in lamp posts because you can’t have trailing flexes into people’s houses. Those will be parking bays specifically only for electric charging of electric cars. But you have got to have enough people wanting electric vehicles, or buying them. They are not cheap. Nick [?] you’ve got one and they are not cheap are they, Nick? Nick: Well they are not and they’ve reduced the subsidy. Lynne: But the more people that get them, the prices will probably go down. So we are reacting as people are asking for them. We have the next list of those wanting to go in. And it’s specifically outside people’s houses or as close as possible, because obviously that is the most sensible thing. I don’t know what will happen if you have a whole street of electric cars but we will look at that as we go along, bit by bit. That is part of the grant, rolling it out as demand comes in. Alec: I think it is important that Tim mentioned the harbour. That ships themselves are polluters, and therefore I think it would be a good idea to consider the shipping companies and the navy contributing something to this issue. Lynne: That is already being done. The navy actually plug in. They put in this big electric cable about 18 months ago. So the naval ships aren’t. It’s the ferries, we are having difficulty persuading them, because the reason for that is swift turn around. They tend not to cut their engines because they come in and they’ve got about an hour or so, before they turn around. But we are certainly working with them. Panellist: Not wishing to be rude, and thank you for doing this unannounced, there were some challenges by Tim. Do you know what year Portsmouth expects to come into legal compliance? Lynne: 2021 for one of them and 2022 for the other, but I can’t remember which way round it is. Panellist: And on what basis are you confident of that? Steve Pitt: I got a briefing from environmental health about a week ago. Please do be assured that the council is going to be held very strongly to account for getting this right. It’s not something we can do, and say “we’ve done the best we can so that will have to do”. There are very, very strict guidelines being laid down by DEFRA, who is now sending a member of their department to Portsmouth every single week, to work with us on this plan. In January , we are expected to come up with a draft plan. If they do not believe it is credible, they can take control of how we manage vapours[?] in the city. If they do not believe in the full business case that we put together at the end of next year is credible, they have the ability to step in. So this is not something that a couple of people are working on to try and tinker around the edges. We are talking it deadly seriously. And we want to make sure that we hit those targets as soon as we can. The deadlines are 2021 and 2022, but if we can get them earlier then we need to do that. But in order to do that, we are going to have to make some very… clear choices around some of those things, for example, on there Tim you have Clean Air Zone. If we don’t do it [reach compliance], it won’t be a choice. That’s how clear this is. Will strong measures be considered in planning? That little list there, that’s not things that might happen, that’s things that DEFRA will do, in Portsmouth, to us, unless we get this right. So please don’t think that we are not taking this seriously, we have to take this deadly seriously. Apart from anything else, we don’t want people breathing air that’s not safe, obviously, because we live here too. We don’t live on a planet elsewhere and beam ourselves down to be councillors in Portsmouth. It’s our home as well. So we are really really clear that we will deliver this. The head of environmental health is working with a big group of officers in the council and we are having to draft in extra people to work on making sure we deliver this. It’s a serious thing and it has to be resolved. Panellist: Tim, are you reassured? It sounds very convincing. Tim: What has been said sounds quite interesting. I am definitely looking forward to the January report. So, yeah, fingers crossed. And thanks for filling in because DEFRA seems to get hung up on the wrong area. Thanks for clarifying that. Lynne: Can I just say I used to teach geography and environmental studies, so I am very keen on improving the environment, right across the board. I’m back this 100%. Matthew Winnington: I’m also on the cabinet. I’m the health, well-being and social care cabinet member and councillor for this area. So to add on the importance of what both Steve and Lynne have been talking about, because it is a knock on from this, it’s all very well for doing these things for clean air now but what it’s also about is the effects beyond the situation, in terms of people’s public health. So as the cabinet member in charge of public health, this is all feeding in to what we are doing as well. But in particular, one of the interesting things that has come out in terms of the research that has been going on, on the public health side, on the CCG on the hospitals[?] on the public health as well, is that actually a lot of areas in the city with the worst air pollution issues are also the areas with the worst obesity issues, for adults and children. So something that the council is bidding funding for, is actually to get [?] obesity and activity for children and adults. We should also have additional help for areas with high air pollution, because then we will have people going around, rather than getting a car or getting a taxi or whatever. They will actually be walking and cycling and getting about in a healthy way. Because that is going to have a really good outcomes in the future as well. One of the interesting things about air pollution in the city is that it is giving us a kick to do things in a more wholistic way. Which is about, “let’s get this air clean”, it’s also saying to us “it’s not just about that. Let’s try and help people so they are not in a situation that they are thinking about using polluting things in the first place.” They go about their business in a way that is better for them because it is going to keep them healthier, but also better for the environment because they are not going to be driving around in their cars. And as Lynne as said earlier, if we don’t do anything about cars in the city, we are going to have utter and complete gridlock. So those have to come done. But the best way to do that is by encouragement, and an even better way is for people to make the choice that they are happy to get around using other forms of transport, and keep themselves healthy, rather than “I’ll just go down the road an pick up the children and do my shopping in the car”. So, that’s some of the work that is going on at the edges, but that is really key to making sure we have something sustainable as well. Because otherwise we could just sort this thing out now and ten years down the line, we will just end up doing it all over again.